finally get our rightful daily dose of sunshine! We have been diligently seeding in the greenhouse the past two weeks, and have some micros that need some harvesting come Wednesday – a true sign of it all beginning again! We get our annual delivery of compost this Thursday, tractor work all day to get that spread around our field, then we’re off to the races with the skinning of the Haygrove on Friday morning! Next week we till and seed the first rounds of lettuces, salad mix, spinach, arugula, radishes, favas and broccoli raab into the Haygrove and work on the usual spring farm repairs that ready us for the real work as the season starts inching closer! 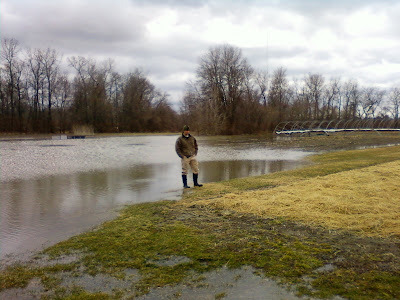 Spence checking out the flooding – just on the edge of our garlic… not too bad! Some chickweed trying to breathe through the icy fortress the flood left behind. Arugula in the hoophouse being strong and vigorous! My favorite day of all – OK, only after pepper planting day, that is! 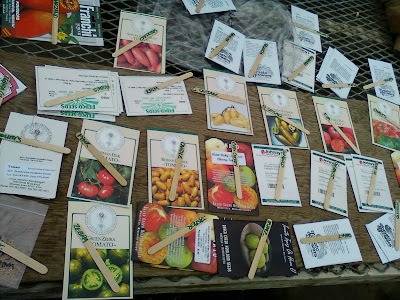 – is tomato planting day! Such great names, textures and smells! Spencer found a squashed grub skin in a package from Baker Creek Heirloom Seeds this year – too funny! I love how tomato seeds range in looks from fuzzy and chubby to skinny and shiny – kinda like the fruits they bear. Can hardly wait to sink my teeth into some of these! T-minus 19 weeks, give or take. Geez! I can promise you the 70 degree weather is coming. It is with me here today, so it should be moving east and reaching you soon. Hang in there! Our mud is finally drying up.